Canada's army participated in its first major overseas campaign during the Boer War in South Africa in 1899. The decision to send troops split Canada along French-English lines, foreshadowing the problems that would arise during the two world wars. 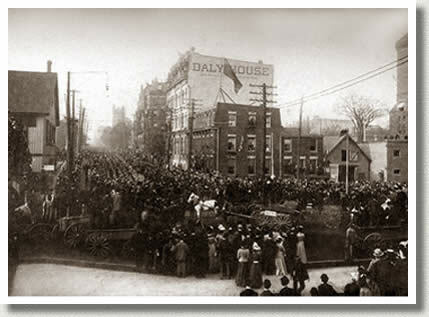 "First Canadian Contingent Leaving Toronto," 1899. English Canadians, by and large, were enthusiastic about Canada fighting alongside Britain in the Boer War. Here, the First Canadian Contingent of volunteers is leaving Toronto on their way to South Africa. 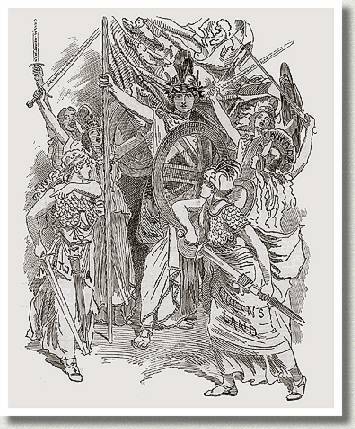 When external enemies threatened Britain, the British press portrayed the far-flung Empire as one big family, happily united behind the mother country's leadership. The artist depicts the Canadian province of Manitoba and Australian territories, such as Queen's Land and West Australia, as staunchly loyal to the realm. The colonies, however, increasingly wanted to determine their own fates. Ethnic groups, perhaps even more so than they do today, commonly saw themselves as superior. Hence, French Canadians commonly believed that the blending of their Catholic faith and rural way of life made them superior to materialistic English Canadians. French-Canadian nationalists sought to isolate themselves from both Europe and English Canada by building a strong Quebec based on the French language and Catholic leadership. On the other hand, English Canadians commonly believed that the blending of British civilization and enterprise made them superior to backward French Canadians. What was needed was a Canada based on just one language and one culture and with closer ties to Britain. Many English Canadians also embraced militarism, or the belief that a nation could be strengthened through warfare. Not surprisingly, when the Boer War broke out, the tremendous enthusiasm in English Canada to fight for the mother country was met by an intense reaction in Quebec against the conflict. The Prime Minister, Wilfrid Laurier, was caught between English-Canadian and French-Canadian public opinion. The former wanted Canada to send troops to South Africa. The latter was strongly opposed to Canadian participation in the war. 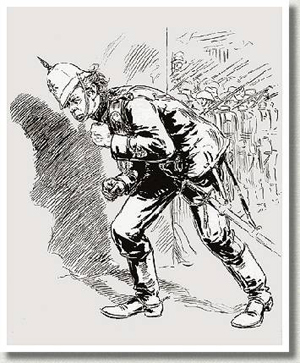 The cartoon shows Laurier hiding while Canadian volunteers, paid by Britain, march off to Britain's aid. The Canadian prime minister, Sir Wilfrid Laurier, did not believe that Canada should be involved, but he faced growing agitation in English Canada to send troops. In this way Canada could demonstrate its importance in the British Empire and share in its military responsibilities. Moreover, the British wanted Canadian involvement. In contrast, French Canadians opposed any participation. Interpreting the conflict as one to preserve a minority culture in the face of British imperialism, they sympathized with the Boers. Accordingly, the fight was purely a British one, and Canada should not be involved. The government compromised and sent an initial volunteer force of 1,000 to serve with Britain; once in South Africa, the troops remained together but fell under the command of the British military. Thomas A. Edison , 2nd Special Service Battalion, Canadian Infantry--Parade, United States, Library of Congress, American Memory Collections, Early Motion Pictures, 1897-1920. Available online at http://lcweb2.loc.gov/mbrs/edmp/2184.mov, [12 November 1999]. Canadian Troops Departing for the Boer War, Quebec City, Quebec, 1899. These Canadian soldiers are marching towards the ship that will take them to South Africa. "Charge of Canadians at Paardeburg." Neither English-Canadian imperialists nor French-Canadian nationalists were satisfied, but Laurier was able to balance the conflicting forces. The government sent the 2nd (Special Service) Battalion of the Royal Canadian Regiment of Infantry, which arrived in time to fight at the Battle of Paardeberg in February 1900. As the war dragged on, the Canadian cavalry, the Royal Canadian Dragoons and Lord Strathcona's Horse, played an important role in the fighting. The Lord Strathcona's Horse, like the Princess Patricia's Light Infantry (PPCLI) raised in August 1914, was privately financed by Donald Smith, Lord Strathcona. Its lineage, however, can be traced back to the School of Mounted Infantry established in Winnipeg in 1885. Some 7,368 Canadians saw action in South Africa, and 89 men were killed in action by the time the war ended in 1902. More than 130 more died as a result of disease. The complications of imperialism would continue to influence Canadian defence policy. The questions of how closely linked Canada should be to Britain and whether Canadian soldiers should be conscripted to fight foreign wars had not been resolved. Russell C. Hubly, "G" Company, or Every-Day Life of the R.C.R., 3rd ed. (Montreal: Witness Printing House, 1902), pp. 77-80. 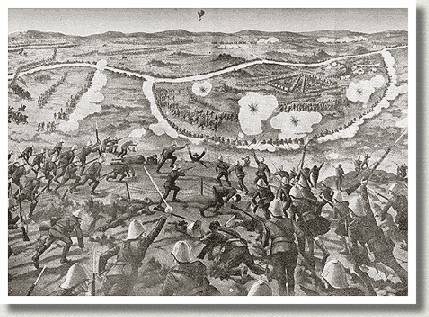 Russell Hubly, a Canadian volunteer in the Boer War, describes his advance from the Canadian trench in the Battle of Paardeburg, 27 February 1900. Copyright Canadian War Museum (CN 85111). 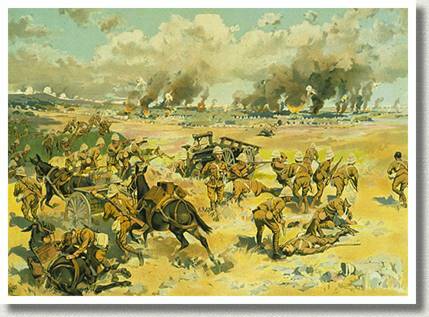 Canadians at the Battle of Paardeberg, February 1900, by Arthur H. Hider. As a result of Canadian participation in the Boer War, the first significant change in the organization of the militia took place in 1904 with the passage of another Militia Act. Sir Frederick Borden, the Minister of the Militia, legislated more funding and more training for the Canadian militia. By this time, Borden had already established a Medical Corps, an Army Service Corps, a Corps of Engineers, and an Ordnance Corps. His long-term goal was to create a Canadian citizen army, with greater autonomy from Britain in military matters. Canada would co-operate with the mother country in times of war, but its forces would not be integrated within the imperial military. These goals and reforms did not give Canada a well-trained military by the time of the First World War, but a solid framework for mobilization was in place.